Blowups | Movies | Style Weekly - Richmond, VA local news, arts, and events. 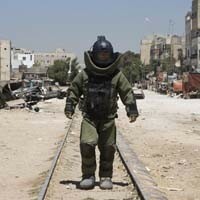 “The Hurt Locker” explodes with tension but lacks a story. The one extended battle sequence in the Iraq War film “The Hurt Locker” feels like a nightmare. The three main characters exchange sniper fire across a vast desert expanse with a distant enemy. Their long-range rifle jams because the spare ammo magazine is full of blood, which two of the men have to painstakingly clean, cartridge by cartridge, while the third waits, unarmed, in full view of the enemy. Like much of the movie the sequence is supercharged with suspense, but it also strains credulity. Only a soldier in a Hollywood movie would lie exposed and unarmed for precious minutes while his buddies bond for the camera. Chock full of tension but missing a story, “The Hurt Locker” is about a military bomb squad used to identify and disarm IEDs, or improvised explosive devices. When the squad&apos;s leader (Guy Pearce) is killed, his replacement, Staff Sgt. William James (Jeremy Renner), joins Sgt. J.T. Sanborn (Anthony Mackie) and Spc. Owen Eldridge (Brian Geraghty) in moving from one spooky bomb site to the next, digging into piles of debris for things that might go boom. Directed by Kathryn Bigelow (“Point Break”), working from a script by Mark Boal, the movie&apos;s visual style is set to kill with edgy contemporary realism, from the obligatory digital appearance to the “NYPD Blue”-like quick pans and in-and-out zooms. The gritty, unsentimental look of the film, while effective, clashes with the more romantic characterization of James as a bomb squad newbie who&apos;s a literal maverick in the mold of Tom Cruise&apos;s character from “Top Gun,” risking the lives of his fellow soldiers so he can strut into hair-raising situations and tear out bomb wiring with a glint in his eye. Here the docu-drama feel obscures how the movie cooks with classic action-flick adrenaline of a type not likely to be found in the real world.